Russia’s life expectancy is said to have decreased to 69.70 years, from 69.83 years in 2011 (via Mark Adomanis via Alexei Kovalev via Paul Goble via Izvestia). The figure for 2011 had in its turn been previously lowered from 70.3 years. So what gives? Does this herald a “disturbing trend”? 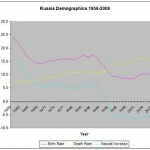 Is Russia entering a period of demographic stagnation, just as it is (allegedly) in economic and political stagnation? Maybe, but let me clear up the reasons for these revisions. It fell from 70.3 years to 69.83 for 2011 because of new data about the population structure from the results of the 2010 Census. Not a decline per se, just an observation that the LE should have been lower than previously estimated. There’s nothing special about this except insomuch as it is now incorrect to talk about Russian life expectancy finally breaking the symbolic 70 year mark (at least for now). Now the decline from 2011 to 2012 is extremely unlikely to be due to an actual worsening in the demographic situation. Mortality has fallen, not by a lot but it has fallen (-1.5%), and it has fallen most in the category “deaths from external causes” (-5%) which primarily affect younger people and thus have a disproportionate (negative) effect on life expectancy. So logically LE should have increased, especially if we also take into account that Russia’s population is also steadily aging. What explains the discrepancy? As pointed out by Murray Feshback, Mark Schrad, and the commentator Alexander Matuzkov on Adomanis’ blog, the method of calculating infant mortality had changed in 2012 – the effect of which was to increase it by 25%, by bringing it into line with international norms. (I had already blogged about it here so it’s a bit embarrassing I hadn’t thought of it myself). Now there’s also some concern that January 2013 saw a big rise in mortality (+9% y/y). Does it presage something catastrophic? 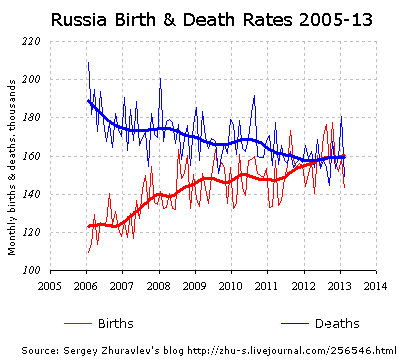 Pretty much no, because month to month mortality and fertility is extremely variable in Russia, due to seasonal factors. 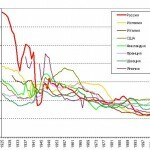 Below is a graph from Sergey Zhuravlev’s blog that eloquently demonstrates the point. Now this is why you should ignore wild demographic swings month to month (just as you shouldn’t extrapolate as to the future trend of global warming from the weather last night). Otherwise you may be making unduly pollyannaish or apocalyptic projections that will more likely than not end up making you look foolish. Some people like to say that Russia has only returned to natural population stability because of high fertility among Caucasus Muslims (who will overrun it and establish a Moskvabad Caliphate, at least in the febrile imaginations of Russian nationalists and Mark Steyn). Well, that is correct in a narrow sense, but in a way that clouds the actual picture. 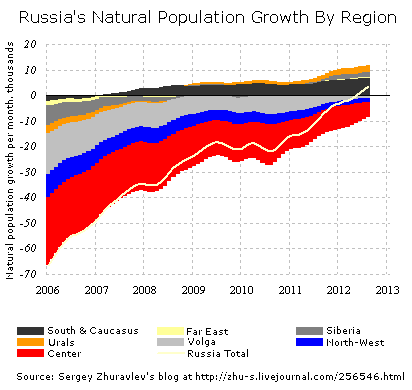 As we can see from the graphic above, whereas the biggest chunk of positive growth does come from the South and the North Caucasus (in practice, all of it would be from the North Caucasus, as the South still has a marginally negative natural growth), the Urals and Siberian regions – all of them predominantly ethnic Russian – have already returned to positive natural population growth, while the natural population decrease in the older, more settled parts of European Russia are now but a tiny fraction of what it was just a few years ago. 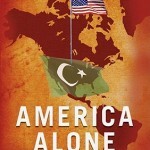 On current trends, the non-Slavic Caucasian peoples will add about a million or so in the next decade, but so what? That’s equivalent to less than 1% of the total ethnic Russian population, which itself will remain roughly stagnant during that same period.